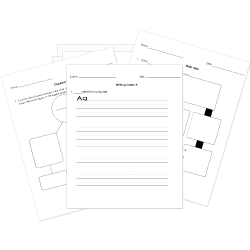 You can create printable tests and worksheets from these Kindergarten Capitalization questions! Select one or more questions using the checkboxes above each question. Then click the add selected questions to a test button before moving to another page. The following sentence is capitalized correctly. Can i color in my notebook? Which sentence capitalizes I correctly? i like your new shoes. I'll be your teacher this year. Mrs. Cook IS one of your teachers. Which word needs a capital letter? Which words in the sentence below need a capital letter? he has a cat named bill.